"Sky Walk" by Joseph Coco, Justin Lee et al. 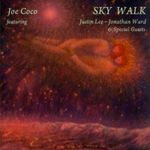 Coco, Joseph; Lee, Justin; and Ward, Jonathan, "Sky Walk" (2016). All Books and Media by Montclair State University Authors. 30.